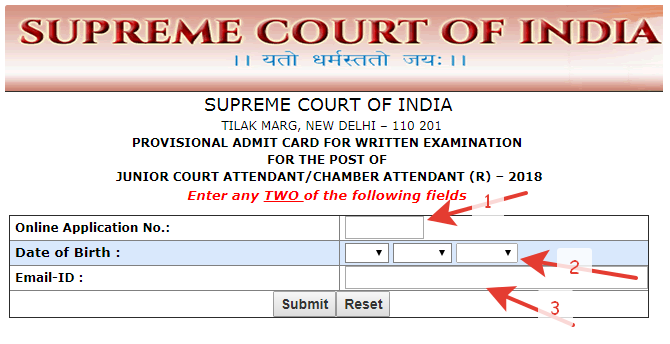 Supreme Court of India recruits various vacancies through competitive exams. if you have applied before for an exam to be an employee of this department, then you should check these issued admit card information. Besides recruitment news, we provide all Hall ticket released date and downloading sources to all job aspirant who visits this Freejobalert page. Look at below some recent issues admit cand for the competitive exam of Supreme Court. on 7th April SC Law Clerk exams will be taken. If you have applied for this then visit the official website which is provided below to download your Hall ticket. Previously we provided the job details in a recruitment news page. You may Check this SCI Recruitment. ◙Download your SCI Exam Admit Card→From Here. Candidates who have applied for the Chamber AAttendant Posts, they can now able to download their hall ticket. The exam scheduled for September 2018. By downloading your SCi Exam Hall Ticket for JCA Chamber Attendant posts. know your exam date and venue. ◙Download the Hall Ticket for JCA Chamber Attendant →From Here. How to download from the official website? You have to open the official website. We have already provided it on the "◙Download" section. Open the page which will look like the below image. Input any two columns either 1 or 2 or 3. Then submit. 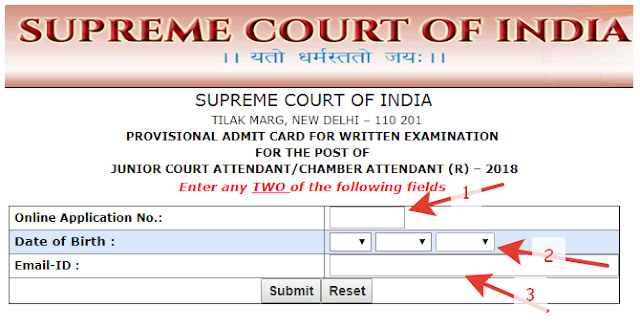 A page will retrieve with your admit card.. Thanks for visiting Freejobalerss.com. We will provide the SCI Result also when the Supreme Court of India will be published.